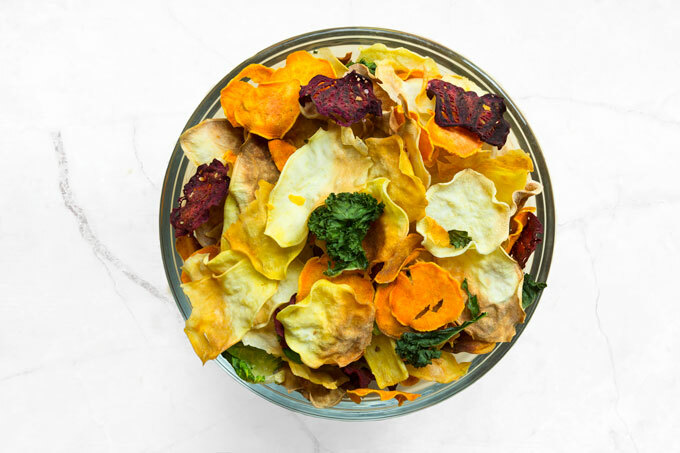 I’ve done a lot of experimenting with these veggie chips to achieve a crisp chip-like texture and can assure you that they are delicious! They definitely stand up to any gourmet store-bought variety for a fraction of the cost. And have I mentioned they are also healthy? I never used to make veggie chips at home. All the peeling, slicing, oiling, baking, and flipping just seemed too intimidating and time-consuming. Why wouldn’t I just go to a store and pick up a bag of veggie chips instead? Well, that’s exactly what I intended to do for a dinner party my husband and I hosted a couple of weeks ago. Except that as I browsed through the healthy aisle of the grocery store (looking for baked rather than deep-fried veggie chips, ya know), all I could find was a little tiny bag of veggie chips filled with air that cost $6! So I headed back over to the produce section, picked up a few different veggies – beets, sweet potatoes, yams, Brussels sprouts, kale, and collard greens – and made my own veggie chips at home. The recipe below is very flexible. You can add more salt, use different spices, or dress the chips any way you like. I keep them plain because my 2-year old daughter appreciates the natural sweetness of the veggies. So, a little bit of salt goes a long way. 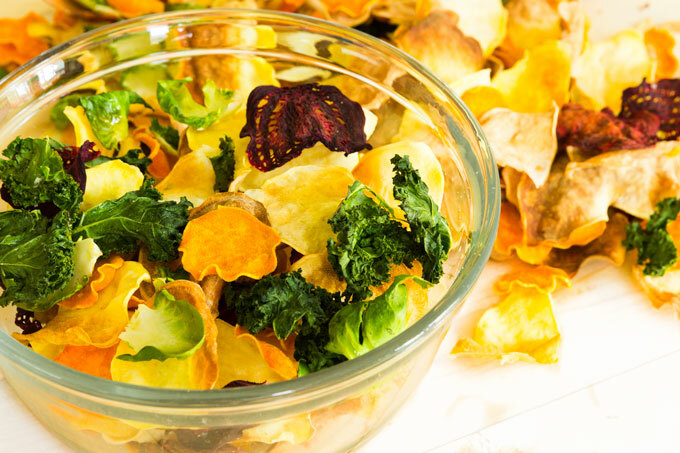 Whether you decide to follow the recipe exactly or change things up, these crispy veggie chips won’t last long! I dare you to eat just one of these homemade chips. It is a downright addictive snack that you can feel good about eating. You don’t even have to be a veggie lover to love these chips. 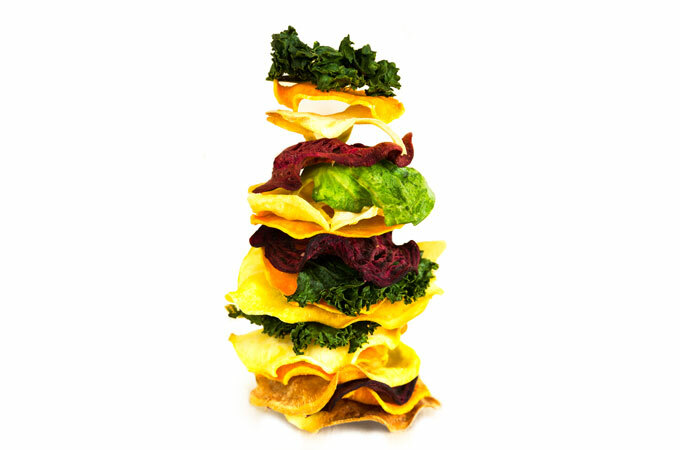 There are two types of veggie chips – chips made from leafy greens and chips made from root vegetables. They differ not only in terms of flavor, but also texture. 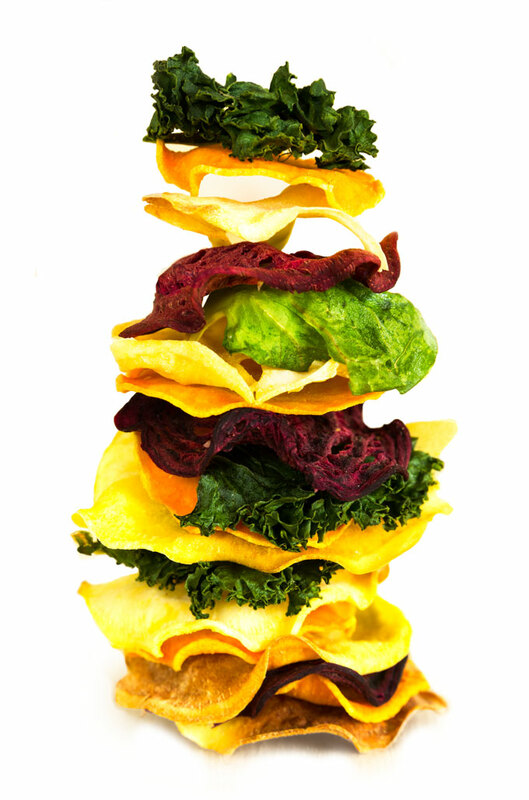 Veggie chips from leafy greens are thin, crispy, and light as air. They still have a bit of a “green” flavor to them, but mostly they taste salty. 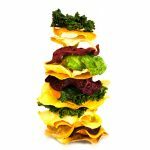 Veggie chips from root vegetables are much more substantial, crunchy, and very close to regular potato chips in terms of texture. A root vegetable chip is subtly sweet, but similar to the leafy greens chips, they do taste salty. Just about any leafy green can be turned into chips. Kale, spinach, chard, collard greens, beet greens, dandelion greens, you name it. I decided to go with kale, Brussels sprouts (the outer leaves), and collard greens. If you’ve never made veggie chips at home, I would recommend that you start with leafy greens because they are really easy to make. I like to also add some olive oil and salt. If you’re not a fan of oil, you can skip it. However, I find that the oil helps the veggie chips cook more evenly in the oven and adds a nice, rich flavor. Keep the pieces large – this step obviously applies only to kale and collard greens. The reason you want to tear the kale into large pieces is that it will shrink quite a bit when baking. Also, the smaller the pieces are, the easier they’ll burn. Wash – the best way to wash leafy greens is to get a bowl of water and let the veggies soak for a few minutes. This will allow for any dirt to sink to the bottom of the bowl. Dry thoroughly – once washed, place the veggies onto a dry paper towel and pat them dry. Remove as much water as possible. If there’s any excess water, the water will steam the veggies while baking. Massage – rather than just coating the veggies with some oil, massage the oil into the leaves to ensure that every piece of the vegetable is evenly coated. Just be careful not to bruise the leaves. Use a parchment paper or an oven rack – both parchment paper and oven rack work well because they allow water to escape. On the other hand, foils or waxed surfaces (e.g. baking sheets) trap water and the veggies steam instead of crisping up. Space them out – make sure the veggies aren’t touching. If you crowd them, there will be too much vapor surrounding them and they’ll steam rather than bake into crispy chips. You can achieve crispy chips with higher temperatures, but it usually means a lot more browning than baking at low temperatures. While some browning is inevitable, browning usually equals carcinogens. Rotate – whether surface you’re baking the chips on, rotate it half way through baking so the veggies crisp up evenly. There’s no need to flip the chips. Cool for a few minutes – cooling the chips after they’re out of the oven helps them firm up even more. A few minutes is all that’s needed. Store – store the chips in an air-tight container to prevent the chips from absorbing any moisture from the air. If the chips lose their crispiness over time, you can put them in a warm oven to get the moisture out of them. Have you ever had Terra chips? If you don’t know what I’m talking about, Terra chips are veggie chips made from root vegetables, including sweet potato, yam, beet, carrot, taro, parsnip, and yucca. Not only do they have a very vibrant flavor, delectable crunch, and a very short list of ingredients, but they are also super expensive. Terra chips were one of the reasons I started making my own chips at home. Making chips from root vegetables is a bit harder than making chips from leafy greens, but it is possible to make even root vegetable chips perfectly crispy by following the guidelines below. Slice them thin – the thinner they are, the easier it will be to get them crisp. Water needs to reach the surface in order to evaporate. So the larger the surface (more area for the water to evaporate) and the lower the volume (less water overall), the better. Soak them in water – this technique works surprisingly well for the sweet potatoes. You simply soak the potatoes for about 10-20 minutes to help release some of the starches into the water. The starch in potatoes hinders moisture from evaporating and prevents the potatoes from getting crispy. Just keep in mind that the longer you soak the potatoes, the more nutrients you lose. So, soak them briefly, swirl them around, and give them a good rinse. Get as much moisture out as possible – moisture plays a big role in how crispy the veggies get. It’s difficult to get anything crispy if it contains a lot of water. That’s why dehydrators work so well. So, pat the soaked veggies dry with a paper towel. Sweat – sweating in culinary lingo means to cook something on a very low heat to release the moisture. But according to Sommer from Spicy Perspective, you can use salt to achieve the same result. So toss the sliced veggies with salt and let them sweat to release any excess moisture. The same steps from leafy greens apply. If you’re wondering if you can also make homemade chips from fresh corn – yes, you can! And yes, they are as addicting as potato chips. Oven-baked crispy veggie chips that stand up to any gourmet store-bought variety for a fraction of the cost. This is a downright addictive snack that you can feel good about eating. Preheat oven to 200°F (95°C) and place the oven rack in the center of the oven. Using a food processor or a mandolin, slice the veggies consistently as thinly as possible (1/16 inch/1.6 mm at the most). This will ensure even baking and crispiness. If you have some ninja skills, you can also use a sharp knife. For extra crispiness, soak the potatoes in cold water for 10-20 minutes to help release starch from the potatoes. Once soaked, rinse the potatoes under cold running water. Spread the veggies onto a paper towel and pat them dry. Place them into a large bowl. Add oil and salt. Toss well. The beets will discolor the other vegetables. So, if that's something you want to prevent, use a separate bowl for the beets. Let the veggies sweat for about 15 minutes until they release their natural juices. Then drain off any excess liquid. Place the veggies into a single layer onto parchment paper (or an oven rack). Make sure the veggies aren't touching. Bake for 30 minutes at 200°F (95°C). Then increase the temperature to 220°F (105°C), rotate the parchment paper/oven rack, and bake for additional 30 minutes. Be sure to watch closely past the 45 minute mark as the chips can burn quickly. Tear kale away from the stem and roughly tear it up into large pieces. Remove the leaves of the Brussels sprouts (you may need to keep cutting away the stem as you get deeper into the sprout). Wash and spin the leaves until thoroughly dry. If you don't have a spinner, place the leaves in a large bowl and cover them with water. Let them soak for a few minutes to allow any dirt to sink to the bottom of the bowl. Place the leaves onto a paper towel and pat them dry. Transfer the leaves into a large bowl and massage in the oil and salt. Bake for about 45 minutes until the leaves are dry and crispy. Rotate the parchment paper/oven rack half way through baking. Be sure to watch closely past the 30 minute mark as they can burn quickly. How long does it take for them to crisp up? I did thin carrot slices on a wire rack at 375 for 30 minutes,and they are not crispy after 5 minutes of cooling. Does it take hours? I read it takes hours to crisp up. Thank you. Hi Erin – a great question. 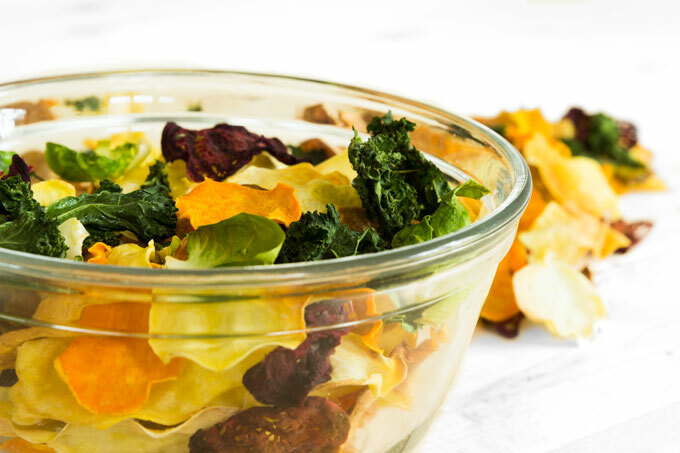 Technically, you should store the veggie chips in an air-tight container at a room temperature. However, I have to admit that we keep ours in an open bowl on the counter for up to a week and the chips always stay crispy. The trick is to make sure the veggies are completely baked (dry) before you take them out of the oven. If they’re not completely crispy, the moisture inside will soften them up over time. Hi, would love to attempt these, as I think my 15 month old would love them (and me too!). Just wondering if they might freeze ok? I’m assuming probably not, as they’d probably go soggy once defrosted, but doesn’t hurt to ask 😉 Thanks! Hi Meagan – a great question. I know you can freeze deep-fried chips by placing them in the freezer in a single layer to freeze, then transfer to a seal-able freezer bag. However, I have never tried it with oven-baked chips. I would say that there isn’t a lot of moisture in the chips to begin with (that’s why they turn crispy once they’re done baking). BUT I am not sure that freezing wouldn’t change their texture. I suspect the chips would lose their crispiness once defrosted, but it might be worth a try with a few chips to see what happens 🙂 We store our veggie chips on the counter and they are crispy even after two weeks (that’s the longest we’ve had them last – yes, we are kind of obsessed with them, lol). Please, let me know if you try to freeze them. I would love to know what happens. Is is possible to make these ahead of time and store for later or does one need to eat ’em up right away? I’ll give it another try. Mine crisped up after removing from the oven but went limp after a few hours. Any advice? Which chips did it happen with? (yam, sweet potato, beet, kale, Brussels sprouts)? And if it was the root vegetables, did the kale and Brussels sprouts chips turn out crispy? If you only made one type of veggie chips, that’s fine. I just wanted to double check this first. So sorry, I though I posted my response. I used some home grown heirloom beets. They were not red but red and pink inside with red skin. I just purchased a regular Detroit Red and will give it another try tomorrow. Figures I’d pick the trickiest to start with! I’m so glad I came across your site. I will take your suggestions and give it another try. I have one big Detroit Red but also purchased a standard yam. Thanks for your encouragement. I’ll keep you posted. Success! Excellent results with both yam and beets. Thank you for your advice. I look forward to reading more on your web site! Great recipe. Could I use a dehydrator instead of an oven to dry out the chips, will it yield the same result? Hi, I can’t wait to try this recipe, it looks great! I was just wondering why you don’t put the baking rack onto a sheet pan to cook the chips? Do they cook better that way for some reason or was it simply to save using more dishes than necessary? 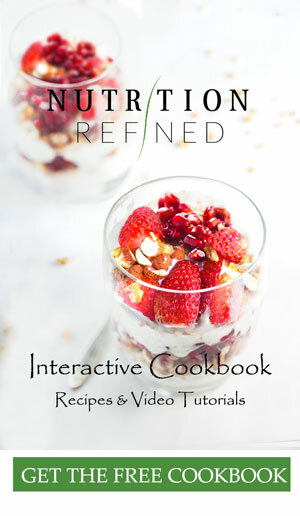 Thanks for all the great recipes and excellent videos! Hi Vi, thank you for your comment! I don’t have much experience with storing chips for commercial purposes. A little amount of oil helps the chips bake more evenly, but you can make the chips oil-free. Commercial chips keep for a long time, in a sealed bag. Often they contain no preservative other than salt, so it would seem that it is doable. However, they are sometimes “packaged in a protective atmosphere” – that is, the gas in the bag isn’t normal air. Humid environments will make chips go bad and become stale quicker. Thank you so much for the reply, Petra. Cant wait to try to make the chips! Hi Petra! I love your recipies and videos! Your attention to detail and effort to make things clear and straight to the point really shows through! And also, love how sweet you are (in your videos and in your comments). I’m so glad I’ve found your blog – your recipes are helping me more creative in my vegetarian dishes. I’ll be following your work!